An Alternative Motion Elliptical that Combines 3 Machines into One! NordicTrack’s Freestride Trainer series is a hot seller in the exercise equipment industry. Customers like the ability to combine the motions from three distinct machines into one package. With the Freestride Trainers, you are getting the benefits of an elliptical, stair-stepper, and treadmill. PRO: Variable motion up to 38-inches. found on most ellipticals. You define the motion instead of being trapped into a fixed pattern by the machine. 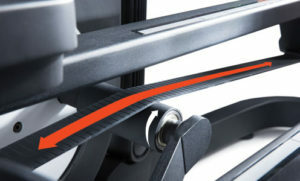 Easy controls on the moving handlebars allow the user to make quick adjustments to keep their moving. By switching up the stride length, you will cause your muscles to constantly adapt and develop allowing for a more effective workout. PRO: 3 machines in one! Each level of stride length on incline will provide a slightly different exercise motion. With a short stride, you will feel like you are on a stair stepper. A mid-range stride will feel like a typical elliptical pattern. The longest 38” stride will feel more like a ground-covering treadmill run. PRO: Very low impact workout. 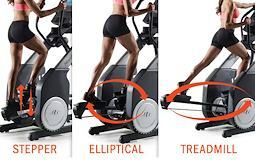 Many ellipticals have wheels that ride on tracks that can be noisy or rough feeling. In contrast, the Freestride Trainer has pedals that ride on belts. This allows for the sensation that you are running on air during your workout. The motion is practically impact free to protect sensitive knees, backs, and hips. PRO: Takes up less space than a typical elliptical. The Freestride Trainer is a center drive machine so it takes up less space than a typical elliptical. The total length on the FS7i is 68” compared to the Sole E95 at 83”. Center drive machines tend to make the user feel more balanced over their feet and provide a strong and steady base of support. PRO: There are several models to choose from. The Freestride Trainer is available in several models including the FS5i, FS7i, and FS9i. Each level of machine has a more sophisticated console display, increased weight capacity, and more programming. The top model has both incline and decline, while the FS7i has only incline. We feel it is NOT worthwhile to spend an extra $1000 for the FS9i over the FS7i. It is our opinion that the FS7i is the best value of the three options! Check out the NordicTrack FS7i FreeStride Trainer Review here. PRO: Track your fitness progress and goals with iFit Live. 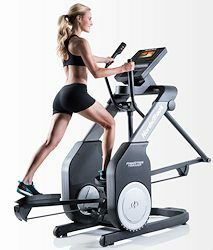 The Freestride Trainer machines come with NordicTrack’s iFit Live. This fitness tracking program will allow you to set goals, track your workouts, and exercise on virtual courses around the world. You can sync the machine with GoogleMaps to create custom routes through famous landscapes or your own hometown. iFit will help you create a personalized workout routine that will get progressively more challenging to help you reach your goals. CON/PRO: iFit Live is not free. iFit Live requires an ongoing subscription for use. This can almost be considered a pro AND a conIf you are a person who loves the features and will use them regularly, then the ongoing fee will be worth the price. Perhaps you want to use the features for 6-months to get back in shape, but then find you no longer need them. You can simply cancel your subscription. Or, if you do not plan to use the features at all, you can forego the cost entirely. There are some other brands that include comparable workout tracking platforms with a much higher initial cost on your machine. With the NordicTrack option, you pay less up front. So take this information and use it how you will. Just be aware that you can’t enjoy the features of iFit for free! CON: The motion may not be ideal for every user. CON: Make sure you allow space in front of this machine. The forward legs of this machine swing forward while it is in use. For this reason, this would not be a good machine to place in corner of your home up against a wall or window. Be aware that you will need some room in front of this machine for its full range of motion.